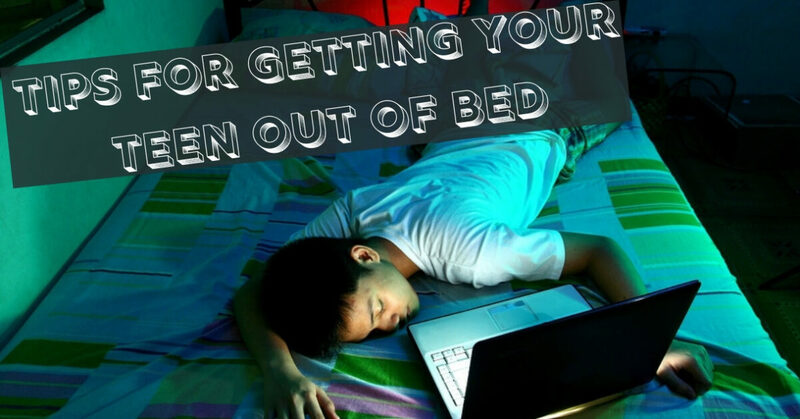 Do you dread getting your teen out of bed every morning? They like staying up late, but struggle to get out of bed in time for school. And on the weekends you’re happy to let them sleep a couple of extra hours, but when they stay in bed until noon you start to get a bit annoyed. If you’re having a hard time getting your teen out of bed, here are a few tips that might help you have a more peaceful morning. Do Teenagers Need More Sleep? You easily wake up in the mornings, and have a happy day on 7 to 8 hours of sleep. Your teen needs a bit more sleep though, and it’s completely normal for them to sleep 9 or even 10 hours a night. The National Sleep Foundation has examined the sleep patterns of teenagers, and found that it’s normal that as your children grow and go through biological changes, their sleep cycles tend to shift to a later time. They often don’t fall asleep until after 11pm, and it they have to get up at 7am every day for school, they’re simply not getting enough sleep. As your teen goes through physical, hormonal, and emotional changes, they really need their rest, and they need that extra time in bed after each day full of taxing demands on the their mental and physical energy. If you want your teen to get out of bed on time, you’ll nee to pay attention to the time they’re going to sleep. Make sure they’re in bed, with their cellphone off, before 11pm so they’ll have at minimum 8 hours of sleep. Make the morning less stressful for everyone, and wake your teen up 10 minutes early. Do you hit the snooze button and give yourself a few minutes to lie in bed? Do the same for your teen. They’ll appreciate having a few minutes to wake up slowly, before they absolutely have to get out of bed. Have you ever woken up early on a Saturday because you forgot to close your blinds? The room filled with sunlight and it woke you up. This is a natural process, and sunlight helps us wake up in the morning by inhibiting the release of melatonin. This hormone makes us feel tired and fall asleep easier, so when it’s blocked, we’ll feel more alert and wakeful. To get your teen out of bed, open their curtains when you go into their room to wake them up. The sunlight will help get them out of bed faster, and feel less groggy in the mornings. Are you able to sleep through a racket? Your teen can’t either. If you’re struggling to get your teen out of bed, use noise to rouse them from their bed. Put on some energetic music, let your younger kids play in the hallway outside your teen bedroom, or clatter the pots in the kitchen. If this isn’t working, put on a playlist of music your teen doesn’t like. They might not be very happy with you, but you will see their face in the kitchen very soon, ready to pick a fight and turn off that horrible racket. Not into the tough love of an annoying soundtrack? Maybe your teen will respond to a gentler approach, and you can try pampering them to coax them out of bed. Make their favorite breakfast so they’ll have something to look forward to, and a better reason to get out of bed than just making it to school on time. Even being told there’s a nice cup of tea waiting for them in the kitchen could be enough extra motivation to get your teen out of bed. When your teen was younger, it was your responsibility to make sure they got out of the house on time. As they grow, you’ll need to shift the responsibility onto their shoulders, and help them realize the consequences of their actions. Missing the first class of the day will result in bad grades, a trip to the principal’s office, or a tougher time getting into the university of their dreams. As they take responsibility for their actions, you can spend more time encouraging them to follow their dreams, and less time fighting to get them out of bed. If your teen hasn’t been able to sleep well, or can’t get enough rest at night, visit us at Sound Sleep Medical to make sure your teen doesn’t have any sleep problems that could be interfering with their health.